Autumn Poetry Festival in Druskininkai 2014. The XXV International Literature Festival "Poetic Autumn in Druskininkai" was held this year 1-6 October, 2014. 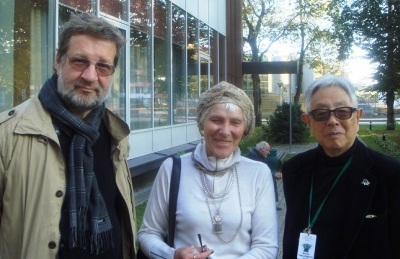 Among the international gathering of poets and literary figures in the resort city of Druskininkai, attending the festival this year was Australian Lithuanian poet Lidija Å imkutÄ—, where she met up with translator of her book "Mintis ir Uola - Thought and Rock" into Japanese, Koichi Yakushigawa. The Japanese translation of her book was formally presented at the Embassy of Japan in Vilnius on October 6. Koichi Yakushigawa has praised Lidija's poetry and has stated "I have compared Lidija's poems to haiku and Japanese paintings. But in fact Lidija Å imkutÄ— has created a world of her own in her poetry". As well as being present in Druskininkai, Lidija travelled widely in Lithuania with readings of her poetry.